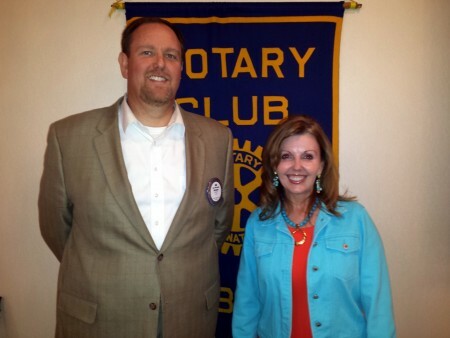 The Auburn Rotary Club recently hosted Ronda Rich, best-selling author, syndicated columnist, and former award-winning sports writer who first exploded on the national stage more than a decade ago with the wildly successful What Southern Women Know (That Every Woman Should), a book now in its 33rd printing. Rich demonstrated for Rotarians her penchant for telling stories that rivet audiences and readers with tales of the South as seen through the eyes of its people. Pictured with Rich is Club President Jim McLaughlin.